On the peninsula behind the Moscow Bridge, on the Prospect of General Vatutin, 2-t, located “SKYMALL” one of the largest shopping centers in Kiev. This is a multifunctional complex of “Dniprovskaya pier” which located on the banks of Dnieper on green zone. The total sales area of the complex is 88 000 sq.m., which contain the leading European brands. Also, visitors can enjoy a food court area with cozy cafes, a supermarket “Ashan” and a two-level parking for 3,000 parking spaces. The shopping and entertainment center “SKYMALL” has been enjoying the fashion world, entertainment and bright programs during 7 years. Over the years, SKYMALL has taken a leading position among the shopping and entertainment centers of this level among visitors. 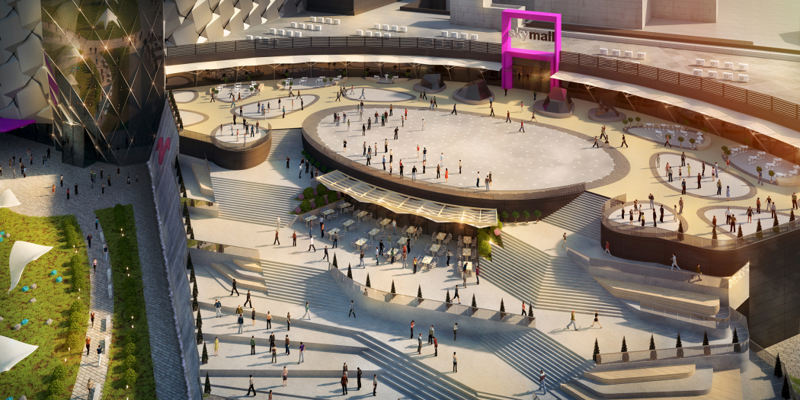 In connection with the growing demand and the desire to make shopping more diverse and rich, it was decided to build a second turn of the Mall. 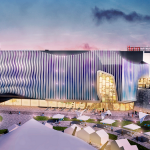 The total area of the second turn of the “SKYMALL” is 75,500 square meters, which will almost double the area of the existing shopping and entertainment center. The project of MEGALINE provides for a harmonious construction of two big zone. 1 level its underground parking for 305 parking spaces, with the possibility of entering the second level of the shopping center. 2 level its zone of boutiques, for various purposes, with separate entrances from the ground level. 3 level its zone of boutiques and a restaurant, the entrance to which is carried out from the large grand staircase. 4 level its main entrance area in the Mall, which includes boutiques, food courts and the zone of the entertainment, which divided into three levels. 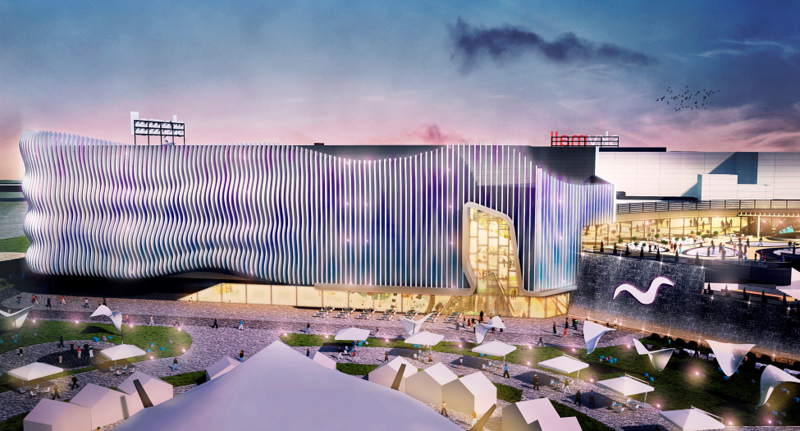 Zone of entertainment will contain modern attractions, making the visitors’ holiday bright, rich and interesting. The entrance to the 4th level is also carried out from the front staircase. The main architectural and artistic accent of Mall is a large front staircase, solved in the form of terraces, which have different functional purposes. On the third level, it leads to the restaurant and boutique zone. On the fourth, includes a terrace with a light and musical fountain (height about 12 m), visitor recreation areas, which is located around the fountain and a large area of food courts. We noted that the fountain for the winter period would be transform into a large ice rink, which will attract visitors of different ages. 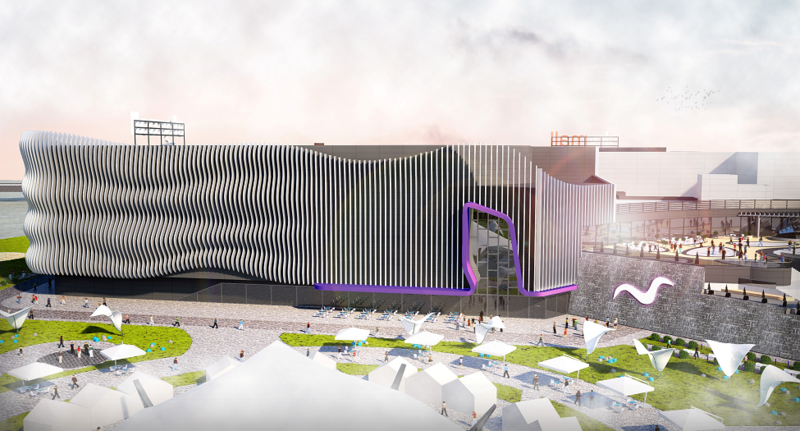 In the summer, it will delight residents of the capital and visitors of the city with its cool and will allow comfortable rest on the summer part of food courts. The facades solved in a modern style. Facing with modern materials in conjunction with bionic forms of facades and architectural illumination, gives to the building an unusual and original view. 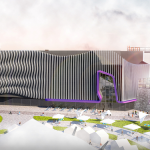 In the entertainment area on the facade, three levels of terraces combined with the zone of restaurants, which will allow visitors to the entertainment center enjoy the stunning views of the Moscow Bridge and the Desenka River. For the passing residents of the city and guests of the capital it will open the view of entertainment and recreation, which they are waiting for when they visit the “SKYMALL”. After the completion of the construction of the second turn SKYMALL shopping and entertainment center will be a large complex of harmoniously inscribed in the existing terrain. 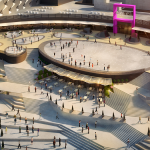 It will Including a huge number of boutiques, food courts, recreation and entertainment zones, which will make possible for guests to spend their free time and leisure time as comfortably as possible.